This interactive picture book features artist Vik Muniz speaking to the reader of the book. He introduces you to his studio and tells the story of his relationship with art, which is a fascinating one. He is perhaps best known for pushing the limits of what is considered art. He created a reproduction of a famous photograph of Jackson Pollock splattering paint but he used chocolate as his medium. He reproduced the Mona Lisa with peanut butter and jelly and he made a piece called Medusa Marinara out of you guessed it, spaghetti and sauce. Muniz first came to my attention after seeing his 2010 documentary, Waste Land. In the film, he tries to come to terms with the seemingly insurmountable quantity of waste in Jardim Garmacho, the world’s largest landfill. For that project, he employed many of the usual landfill’s garbage pickers to help him sort and separate the garbage. After that task was complete he hired them to arrange the garbage in an organized manner to create huge pieces of art in a warehouse. His goal was many-layered, but one was to teach the community that anything could become art. The segments about the dump in the book have fabulous fold-out sections that can help kids to realize the scope and scale of the undertaking. The portrait on the left was sketched onto the ground in the warehouse. The community worked together to fill the shape with garbage making the final project on the right. The book also has lift-the-flap surprises on many pages and designed with Vik Muniz talking via comic book word bubbles. He also talks about many artists from ancient history to Jackson Pollock and Chuck Close. Vik Muniz explaining ways that kids can think differently and notice that art is all around them. This book will compel even the most persnickety reader, at least visually. 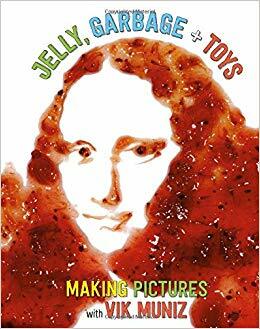 For any readers inclined to be interested in art, it is likely to encourage bouts of creativity and for the daring teachers and parents out there, maybe offer for your kids to play with their food.